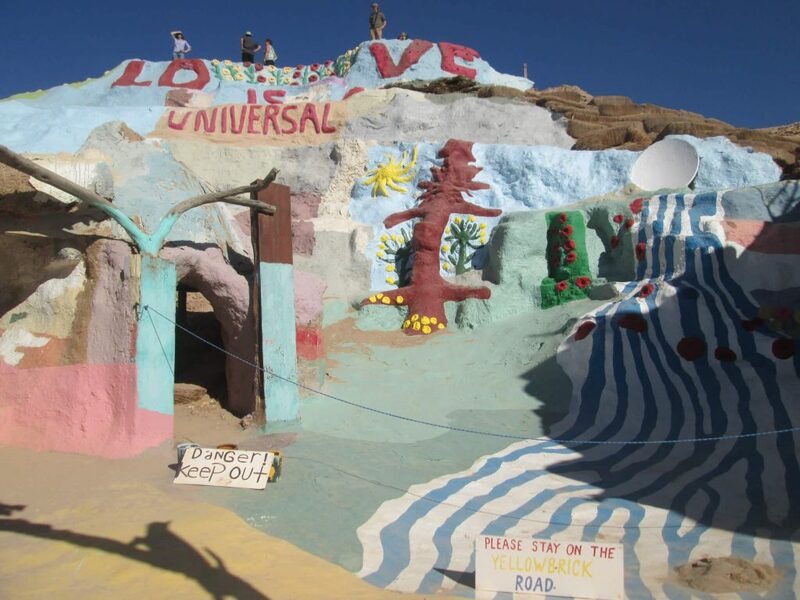 Quirky Southwest Road Trip Colorado New Mexico Arizona California - Come adventure with me. I can’t resist a good road trip. Two years ago we did a northern, western road trip. This year, we decided to hit the southwest during the holidays and visit some of the best southwestern National Parks (and not the Grand Canyon!) 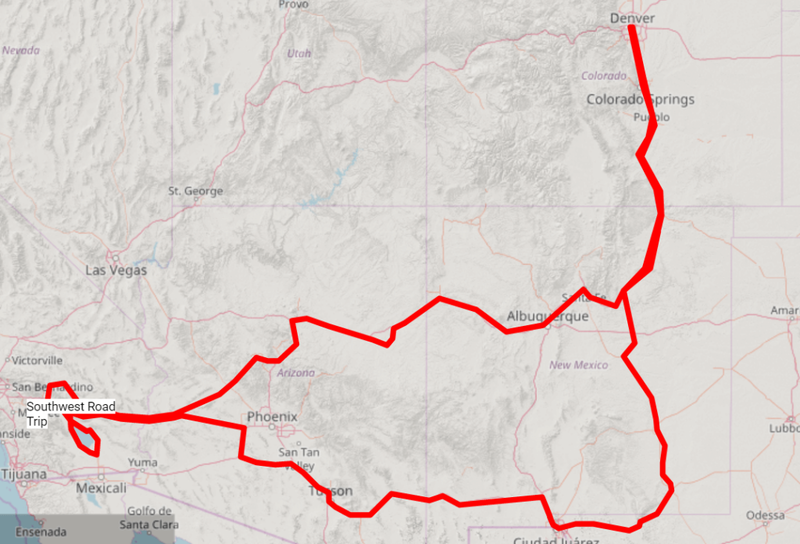 Buckle up, here’s my southwest road trip report through Colorado, New Mexico, Arizona, and California, hitting Meow Wolf, Petrified Forest National Park, Joshua Tree National Park, Salton Sea, Biosphere 2, and Carlsbad Caverns National Park. We headed out of Denver the day after Christmas south on I-25. Hunger growled in Pueblo, so we yelped up the Hanging Tree Cafe for a quick bite (try the yummy daily quiche) before heading back to the interstate. We arrived in Santa Fe about six hours after leaving Denver, staying at a friend’s house and staying up late playing Cards Against Humanity, a game that requires good friends, open hearts, and perhaps some delicious wine. 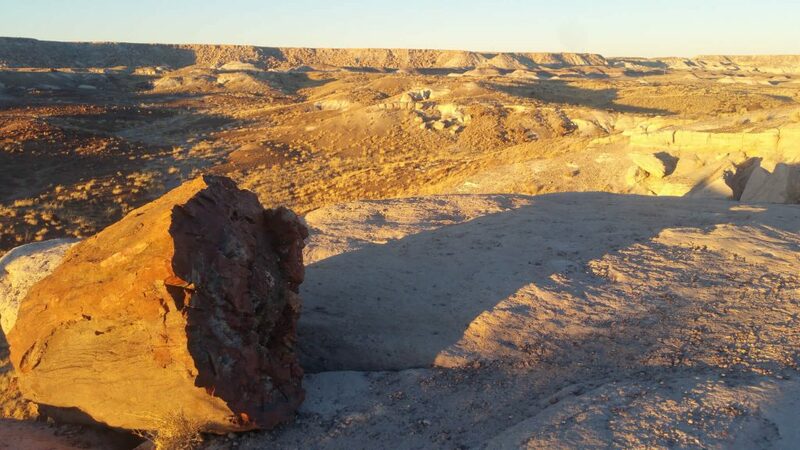 Our priorities for the next day were to get a quick urban hike in, enjoy Meow Wolf, and make it to the Petrified Forest National Park around 3:30, in time for amazing sunsetting colors. I threw on my Altras (the only shoe I brought with me on this multi-activity trip), grabbed my favorite water bottle, and told my friends I’d meet them at Meow Wolf. 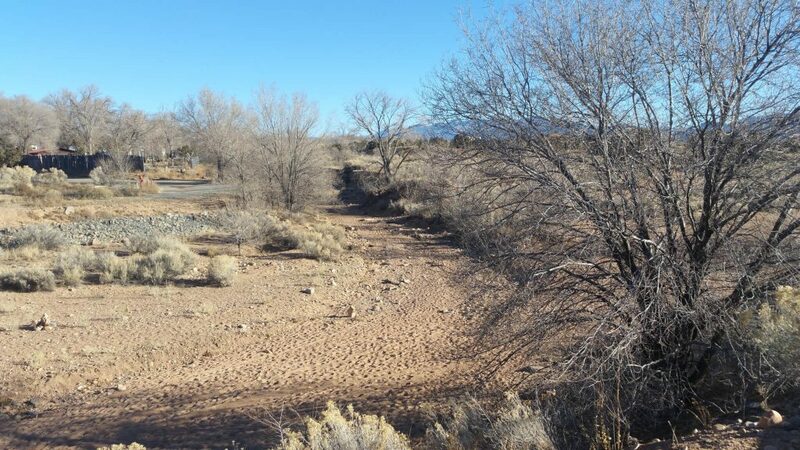 Santa Fe is full of urban trails leading along dry creek beds. I jumped on the Arroyo trail that ran along Camino de los Arroyos and arrived at Meow Wolf at its opening time to meet my family. The line nearly wrapped the building. It separated into two sides, one for those with tickets, one for those without. Fortunately, my friend had purchased our tickets with her New Mexico resident discount, and we queued up to get into the front doors about 15 minutes later. 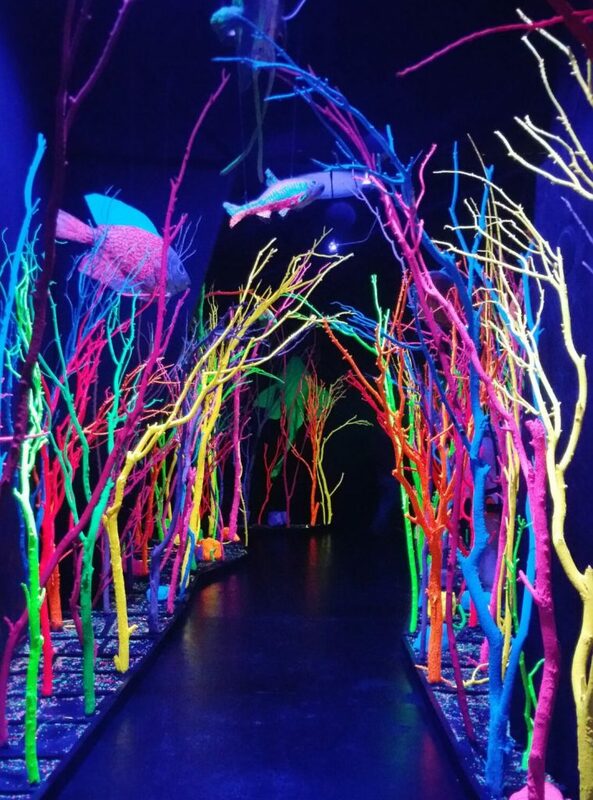 It was a mad house, and it prompted me to write this blog post, Tips for Visiting Meow Wolf as an Adult. I wish I would have been able to follow my own tips, but none the less, we enjoyed the adventure and can’t wait for Meow Wolf to open in Denver. After two hours, we said our good byes, grabbed a burrito from the food truck parked in the lot, and headed west on I40 to the Petrified Forest and Painted Desert National Park. I have been wanting to go to this Petrified Forest National Park for decades. But it’s always been just a bit too far away on a day where the miles were adding up. This day, though, we were going! Be sure to stop at the Visitors Center just off the interstate, but the meat of the park is about 20 miles down the road. And worth it. Totally worth it. With better views than the Grand Canyon and a more intimate experience, be sure to pull over to the pull overs to capture the views of the Painted Desert. They are subtle and grand at the same time. If you can time your visit to the sunset hues of the day, you’ll see amazing depth of color across vast landscapes. Make your way to the center of the park, south of I-40, to the central Visitors Center. 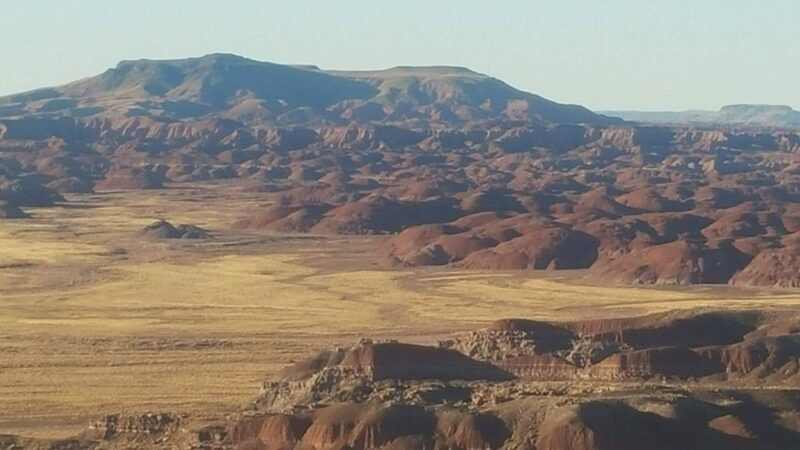 There, get out and walk the undulating 1.5 mile path through the remains of the petrified forest. You’ll see giant tree stumps and felled logs of stone radiating gorgeous rusts, reds, oranges and browns. Make sure to read the interpretation in the Visitors Center and along the path. We were able to catch the hike right at sunset, a dream come true for me. When we had our fill of petrified trees, we headed south out of the park to State Road 141, then north to I-40 west, then I-17 south to Prescott. Staying the night in Prescott, grabbing a hotel breakfast, and then hitting the road again for La Quinta, CA, we headed out early the next morning. If you have the time, enjoy Prescott–a pine-filled western town with a quaint town hall and beckoning Main Street. Having been there many times before, we skedaddled to drive through the Prescott National Forest. State Road 89 south out of Prescott is a twisty, turn-y nightmare for anyone with car sickness. Make sure they sit up front. But it is eye-catching and filled with tall pines, and it takes you to Aquila where you can catch State Road 60 to I-10. Right after you catch I-10, you must stop in Quartzsite for four reasons; to get gas, visit Gem World, pay tribute to Hi Jolly National Monument and eat lunch at Mountain Quail Cafe. After getting gas at cheap Arizona prices, stop in the wholesale/retail Gem World. Millions of pounds of gems await your crafting and jewelry-making skills for pennies. 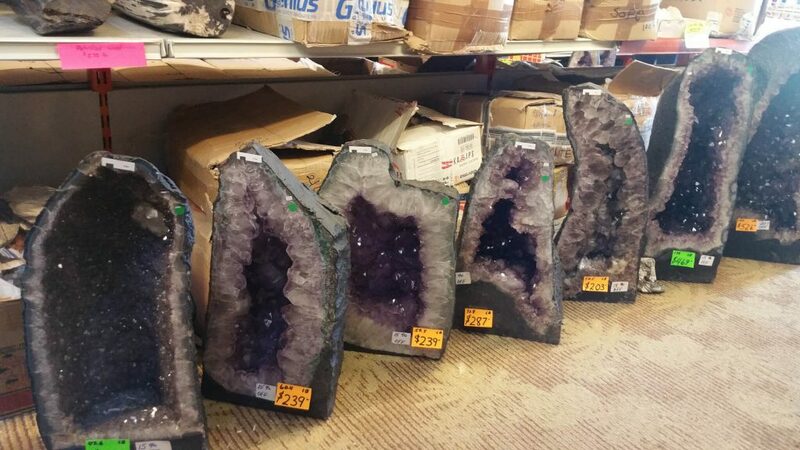 This giant warehouse is a vacation destination for rock hounds, gem gypsies, and bead beauties. You won’t get out of there for less than $50 and 10 pounds of rocks. Enjoy it. The Hi Jolly National Monument sits right down the street and deserves your tribute. 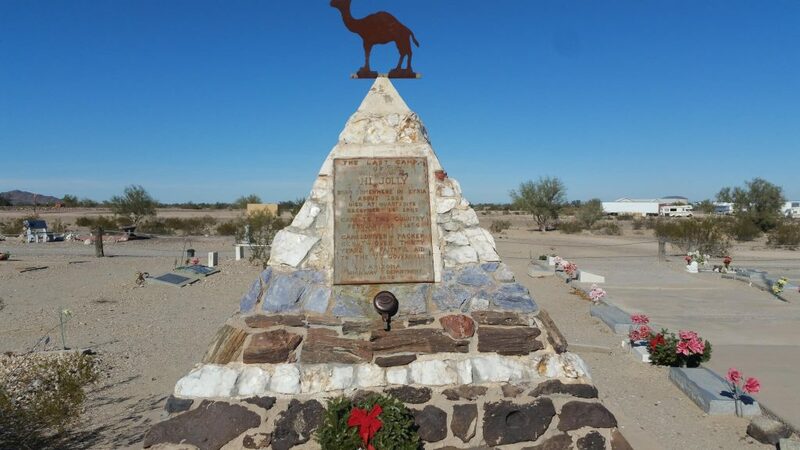 It’s the gravesite of the original camel wrangler of the southwest. You have to stop by and see it. Be sure to read the good Wikipedia article about Hi Jolly. 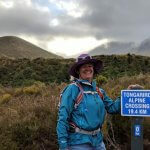 Finally, not far from Hi Jolly is the adorable Mountain Quail Cafe. If you haven’t figured it out by the time you get to the Cafe, Quartzite homes all the California seniors escaping high retiree prices. Mountain Quail is the kind of place where Flo works. Get the grilled tuna melt. After you’ve bought your gems, paid your tribute and enjoyed your melt, head west on I-10 to La Quinta. We stayed at a family member’s house for a few days, enjoying good chats and eats. During the day, though, we took two day trips; one to Joshua Tree National Park and the other to the Salton Sea. Joshua Tree National Park is a don’t miss. But it’s crowded. Every Californian and her brother invade the park like ants on sugar. So try and pick a low-visit time during the weekday to visit. We went during the week between Christmas and New Year’s, so it was packed. Even if you have to go when it’s packed, just go. The best way to approach the Park is from the southern entrance off I-10 at exit 168 and the Cottonwood Visitors Center. Head north from there to Barker Dam. Bring water. Lots of it. Snacks, hat, blah blah blah. 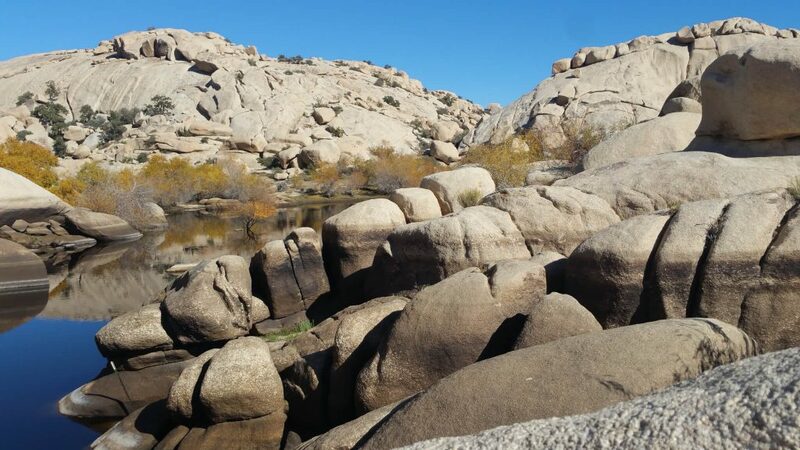 My favorite trail at Joshua Tree is the Barker Dam Loop. The remains of an old dam hold a pond of water that attracts hundreds of birds. It’s literally an oasis in the desert. The hike gets into some soft sand, but mostly the trail is packed sand with cholla, Joshua Tree, and other cacti awaiting your awes. Try not to be annoyed by the adrenaline-pumping idiots ignoring the Do Not Access signs. Find a spot overlooking the dam and just Zen out for a while. You’ll love hearing the chirps and tweets of the migrating birds and the breezy drafts. When you’ve had your fill of U2’s album and/or the Park, head north out of the park to State Road 62 and drive west. Take the short cut of North Indian Canyon Drive. At the intersection with Dillon Road, just north of I-10, you’ll find the best date shakes in the world. I’ve been coming here since I was five; now tour buses stop in. Don’t question me. Just stop at Windmill Market, a little dive fruit stand, and order a date shake. It’s the best, dreamiest treat that will surprise you and leave you asking for seconds. Just do it. I promise. Our second day trip took us around the Salton Sea. An engineering screw-up from the early part of the century, 100 years ago, the Salton Sea’s sad demise speaks volumes about scarcity, survival and the bizarre. Way back when, the Army Corp hired an engineering firm to divert the Colorado River. They screwed up, and the river breached its banks for two years. The runaway water found the basin of the desert and settled, resulting in the Salton Sea. Over time, various entrepreneurs made an attempt at waterfront resorts, boating schemes, and vacation living. But a basin catches all things, including all the runoff and muck from California’s Imperial Valley, a major agricultural landmine. With no fresh water coming into the Sea, it started to smell and turn salty. Finally, a few years ago the various water boards around the Sea signed an agreement to let the Sea shrink. This is where our story picks up. The east side of the Salton Sea is much more entertaining than the west. Head south out of La Quinta and take Road 111. You first must stop at Bombay Beach to see its remains and its drive-in. Be sure to get out of the car and walk out onto the beach where you’ll see the shocking shrinking of the Sea and its impacts. 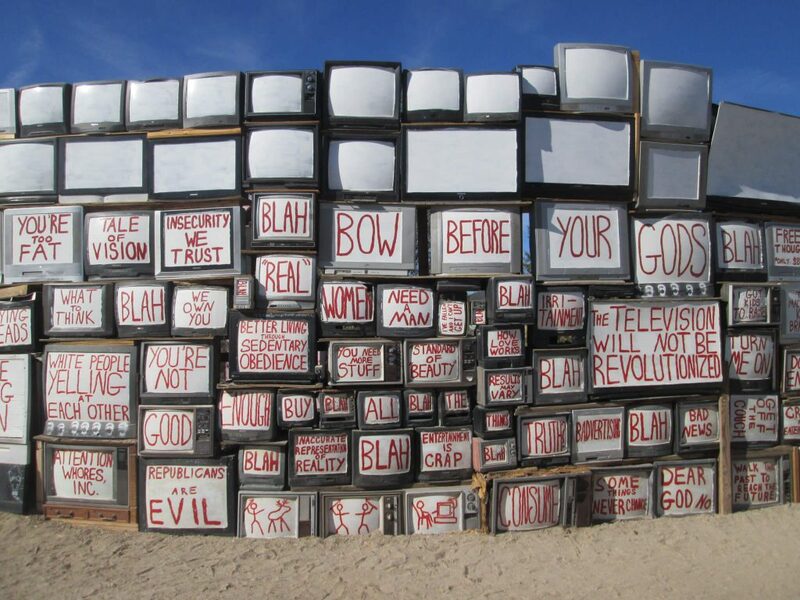 Continue southeasterly, and hear the call of the Christian cult or the King of Folk Art–I’m not sure which one–and make your way to Salvation Mountain near Slab City and its eastern cousin East Jesus. Be ready for quirky, bizarre, and downright odd. In Brawley, grab some authentic Mexican food at Christine‘s. I’m not a meat eater, but if I were, I’d tell you to order the machaca burrito. If I ever decide to eat meat again, it will be because I couldn’t resist machaca any longer. You’ll be at the southern end of the Salton Sea. When you’re ready, head north on State Road 78 to State Road 86 through the palm tree groves, the spinach fields, and more agriculture than you can imagine. You’ll come to the Salton Sea Beach and follow the signs for West Shores Marina, where boats used to dock. Now, it’s a small diner the locals party in for New Year’s, and tourists come to race their ATVs and motorcycles. If Quartzite was the place for fleeing California seniors, West Shore is the place for those who didn’t flee. Grab a beer and watch the fun out the Sea-facing side of the bar. After our Salton Sea adventure, it was time to head back to Colorado. We decided to take the southern route. We loaded up the car, headed out I-10 to Tucson, and made our first stop at Biosphere 2. 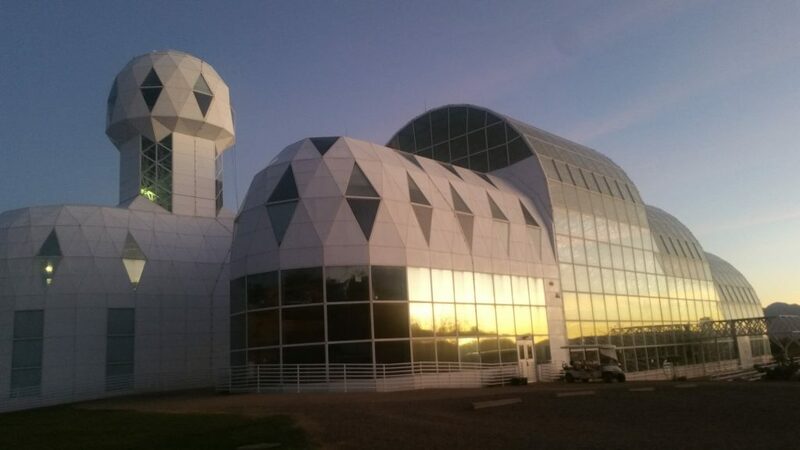 Originally a self-contained living experiment where bio-nauts tried to live for two years without any world help, it’s now a giant lab for the University of Arizona to play in. It’s a fascinating place with its own ocean, desert, and rain forest. Be sure to get there for the last tour and watch the sun set on the desert over the Biosphere. The next day, we sped off to El Paso, and then took a northeast track to Carlsbad. 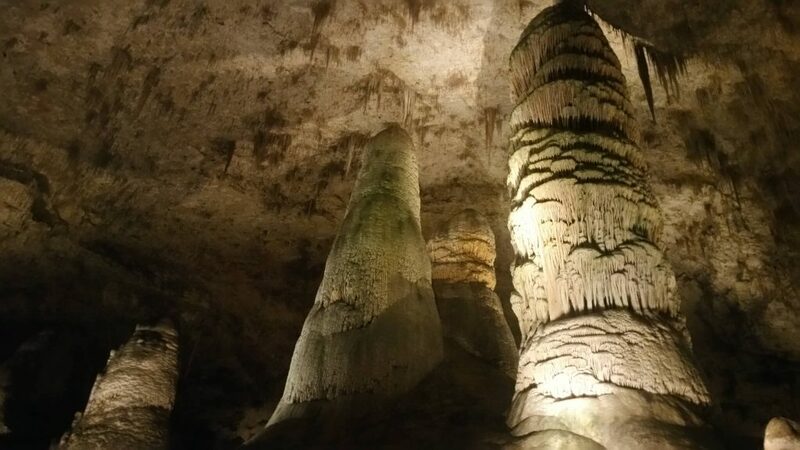 Again arriving just in time for the last tour at Carlsbad Caverns National Park, we journeyed underground for 700 feet to the largest cave room in North America. A lighted path lead us through about 1.5 miles of trail where lights showcased cave formations. Quiet, serene and amazingly beautiful. Trying to find a place to stay in Carlsbad took an act of God. Eastern New Mexico is having an oil/gas boom, and every oil man in Texas is in Carlsbad drilling for liquid gold. All the hotels are booked for years ahead and filled with crew. The La Quinta wanted to charge us over $175! For a La Quinta! Instead, we opted for a nice room in an AirBnB and a dinner at El Jimador, a cheap Mexican place where all the oil crew dines as well. Make sure to order an horchata! After an urban amble through boring Carlsbad, we headed north on State Road 62 to 285 to Roswell. Make sure you drive through town in Roswell rather than taking the bypass. 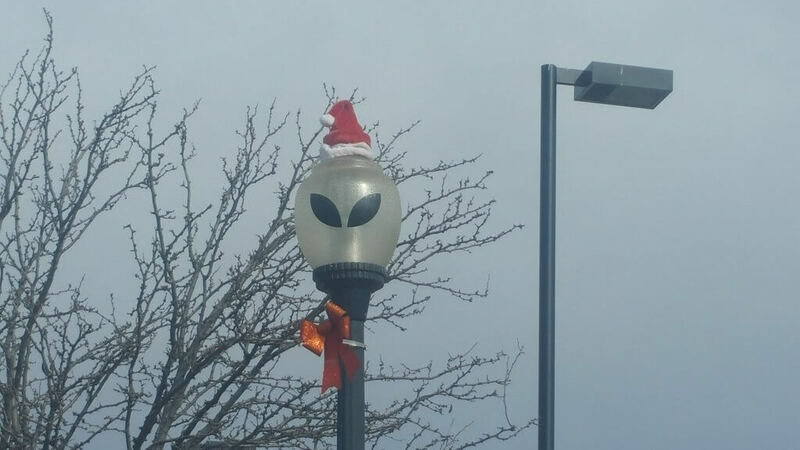 My friend recommended we stop at the UFO Museum, but we didn’t have time. We wanted to get back to Denver by 8 pm. We did take time to enjoy the martian lamp posts and the martian-eating Dominos. State Road 285 catches I-25. From there, it’s a straight shot back to Denver, 3000 miles later! Have you visited any of these places? What’d you think? What’d I miss? Post your pics and take them #eatwalklearn. PS See the interactive map below.